Death Place: Süßen, Baden-Wurttemberg, Germany. Also wrestled as "The First Athlete of France", "The First Wrestler of France", and "The First Hercules and Wrestler." This was during the early 1830s. During this time he first appeared as a wrestler and issued opened challenges. Dupuis appeared as both a wrestler and strongman. "Circus Gymnasticus/Gymnastique" & "Circus Olympique Madame Laura de Bach"
Dupuis appeared as a strongman and wrestler. Jean Dupuis, "First Wrestler and Athlet" Together With Katharina Teutsch (of Germany), "First Female Hercules of Europe"
Rappo, son of strongman and athlete Carl Rappo. Dupuis made open wrestling challenges. This took place during the Leipzig trade fair. Dupuis appeared as a wrestler and strongman. Dupuis appeared as a wrestler and strongman; issuing open challenges. Katharina Teutsch left the troupe in late 1840; Victoria Kuhn became a new member; Dupuis later married Victoria who appeared under the name "Madame Dupuis"
A book was published with the title "Jean Dupuis - Athlet und Ringer" (1st edition); May 1852: 2nd edition; January 1854: 3rd edition was published; November 1857: a new edition was published by the Karl Pleuger publishing company in Passau, Bayern, Germany. Many newspapers reported about this match. Meisinger remained to be the defeater of Dupuis until his death in 1850. Decades later there were also newspaper articles about this match. 1 - Jean Dupuis def. ???? 2 - Jean Dupuis def. ???? 3 - Jean Dupuis def. ???? The original Circus Gymnasticus was closed in 1850. Laura de Bach kept the rights until her death in 1851. 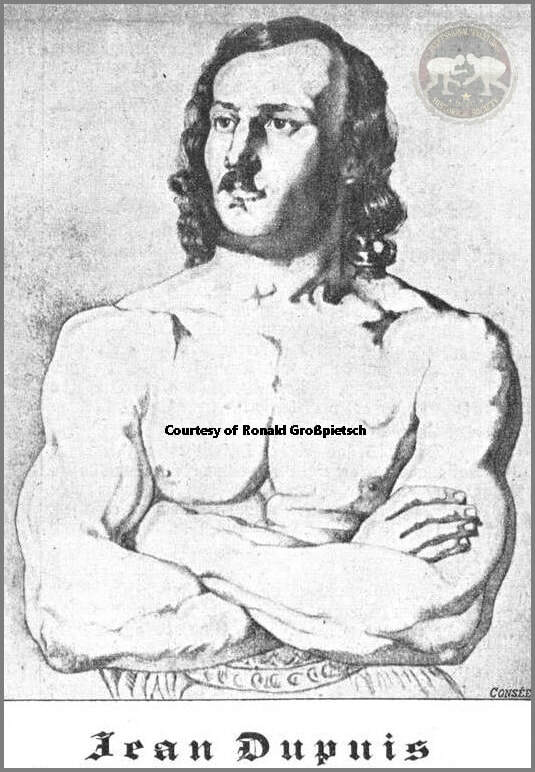 1 - Featuring the "First Hercules and Wrestler of France"
This was in late April 1850. Erhard Bonnet challenged Jean Dupuis. 1 - Featuring Jean Dupuis & Madame Dupuis, "the First Female Athlete of the World"
Jean Dupuis named his troupe "Circus Gymnasticus"; later Dupuis' circus was known as "Circus Gymnastique" & "Circus Olympique". During the 1850s, 60s and 70s Dupuis toured with his circus across Southern Germany (Bayern and Baden Wurttemberg) and Western Austria. It featured gymnastics, tightrope walking, ballet, mimes, acrobatic, strongman and athletic shows. Jean Dupuis retires from active sports at the age of 66.